BRUSSELS, Belgium -- NATO members should step up efforts to help Ukraine in its conflict, the alliance's former chief said Wednesday, warning that a Russian proposal for a peacekeeping force was a "Trojan horse". Former Secretary General of NATO Anders Fogh Rasmussen said NATO nations should supply defensive equipment to Ukrainian forces battling Russian-backed insurgents in the country's east. Anders Fogh Rasmussen said NATO nations should supply defensive equipment to Ukrainian forces battling Russian-backed insurgents in the country's east in a conflict that has claimed more than 11,000 lives since it erupted in 2014. Russian President Vladimir Putin last month asked the UN to approve a lightly-armed peacekeeping force to protect international observers monitoring the conflict zone in eastern Ukraine. Rasmussen, who was NATO secretary general from 2009 to 2014, told an event in Brussels that Putin "may have changed his calculus" following tighter international sanctions over Russian interference in Ukraine. He said the proposal could be a "first indication" the situation may start to change, but urged caution on the peacekeeping force. "In its current form Putin's peacekeeping proposal is what I would call a Trojan horse, it is a non-starter," Rasmussen said. "But I think we need to seize the moment and try to reshape it to put him to a test, because this is our first opening in years to actually end the conflict, so I think it would be a big mistake just to denounce his proposal." A peacekeeping mission was needed, he said, but one with "the right mandate, the right terms and the right capabilities". Kiev, which has long called for UN peacekeepers to be deployed, fears Moscow would use any force to lock in gains made by Kremlin-backed rebels and is simply trying to ease the international pressure it faces. Some 600 observers from the Organisation for Security and Cooperation in Europe (OSCE) are on the ground in eastern Ukraine but have failed to stop the fighting. Ukraine has submitted an alternative to the Russian proposal which goes significantly further, deploying UN peacekeepers across the east of the country including on the border with Russia to prevent armed forces from entering. Former Danish prime minister Rasmussen said he recently visited Ukrainian forces on the frontline in the conflict-torn Donbass region who told him they needed not heavy weapons but secure communications equipment, night goggles and the like. "I think NATO members could do more by providing defensive systems to Ukraine so that the Ukrainian military improves its capability to defend itself and defend Ukraine," he told AFP. "I think it will raise the costs of Russian aggression so that it could eventually also change the calculus in the Kremlin." 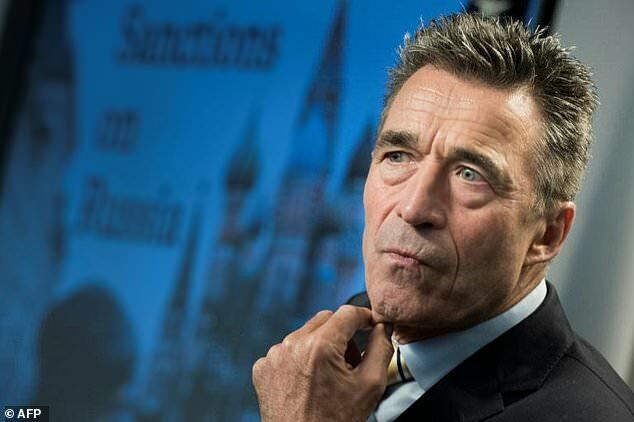 Rasmussen, who was replaced by Norway's Jens Stoltenberg, played a leading role in shaping the early NATO response to Russian aggression in Ukraine. Ukraine has been pressing the west to supply it with offensive weapons to take the fight to the rebels, but the international community has been wary of doing anything that might escalate the conflict.